Buku Kimia Fisika ini harus dimiliki oleh para ahli kimia fisika. Buku kimia fisika ini sangat bagus untuk mulai mempelajari kimia fisika. Every chemist should own a copy of this uniquely thorough yet incisive treatment of the basic principles of physical chemistry. 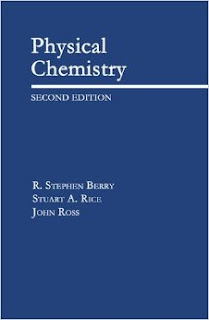 Written by three eminent physical chemists, the second edition of this exceptional work is the most lucid and comprehensive physical chemistry reference available. The authors present the fundamentals of the three major areas of physical chemistry--the microscopic structure of matter, the equilibrium properties of systems, and the physical and chemical kinetics of transformations of systems--in a logical sequence, from the simple to the complex. Beginning with atomic and molecular structure, they progress to properties of condensed matter, to statistical and thermodynamic properties of systems in equilibrium, and then to transport phenomena and chemical reaction processes. The book's mathematical level begins with elementary calculus and rises to the use of simple properties of partial differential equations and the special functions that enter into their solutions. The conceptual structure of physical chemistry is emphasized throughout and appendices develop the details of the mathematical tools as they are needed. Download Buku kimia fisika di sini.